Are you as ready for spring as I am? I feel like I have spring fever and am desperate for a little Spring in my home! Especially since it’s April 18 and we have just received another dump of snow in Toronto! Enter: Making My Own Spring Wreath. I decided to join Maid2Match and get them to do all the spring cleaning this year so I’d have time to start clearing out my wardrobe and bringing in my spring clothes. Then Mother Nature decided she wasn’t ready to give us Spring yet, so I had to take out all my sweaters again because, well, it’s still wintering outside! I know. Gross. Since Spring wasn’t making her debut in the great out-of-doors, I figured the least I could do is add a little spring to my step and joy to my heart by bringing Spring indoors. That’s when Spring wreath ideas began to percolate in my heart. I’m on a super tight budget right now but I was desperate to have some flowers in my room to brighten things up. My yearning led me to DIY my own spring wreath! And guess what?! Each wreath cost me less than 10$! Which is awesome because they’re unique, they suit my minimalistic/simple/feminine style and took me less than 15 minutes to put together. The average wreath I found at the local craft store was upwards $50 and to be honest, I like mine much better. 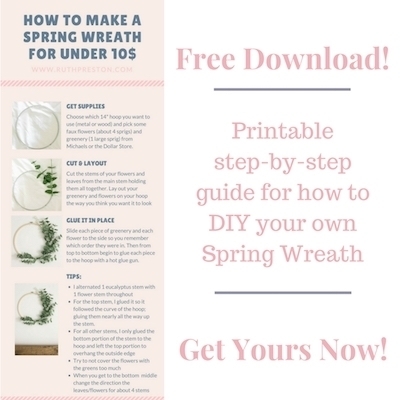 So if you’re on a budget and have 15 minutes of spare time, join me in making your own Spring Wreath! In this post I’ll show you what I made (and trust me, if I can make it, YOU can make it! ), I’ll let you know where I bought everything from, and then I’ll give you a step by step tutorial on how to make your own so you too can “springify” your house! Success! Your download is waiting for you in your e-mail now! Enjoy! Spend a bit of time on Pinterest or Google Images or Instagram deciding what you like. Do you want a wreath covered in flowers or maybe more greenery? Do you want the flowers to totally encircle the wreath or to look more like a crescent moon? Once you’ve decided what you want to make then you’re ready to make it! I decided I wanted mine to be simple: crescent-shaped. I wanted to use faux plants so it would last longer and be re-usable for next year. Featuring mostly greenery and only a few spring coloured flowers was also very appealing to me. Finally, I wanted to use fairly large metal or wood hoops. I actually had been gifted these at Christmas so I had one of each in storage. With this in mind, I decided to make two spring wreaths to hang on the wall above my bed frame. You’ll be able to see what each of these looks like below if you’re not sure if you want a metal or wood frame yet. I also made a small dark eucalyptus leaf wreath for above my mantle (not pictured here). These wreaths are also perfect for hanging on the front door as well! Even though you’re on a budget, that doesn’t mean that you can’t have nice things. Michael’s Craft Store is having a 40% off sale for everything spring and flowers/greenery. How perfect is that?! I recommend heading to the dollar store first to see if you can find flowers and greenery that you like. The flowers I got (see pictures above/below) were actually from the dollar store! They cost 1$ per sprig and I only needed 4 sprigs. I got dark eucalyptus from the dollar store to use on my small wreath 10″ wreath as well. I needed 3 sprigs and each cost 1$. I then went to Michael’s and got some really beautiful light green and soft eucalyptus (similar here) for my big wreaths. This eucalyptus was 50% off thanks to the big sale and I got it for 10$. One sprig was enough to do both wreaths! I recommend picking up the hoops from Michaels. Wooden embroidered hoops range from $1.49-$3.49 depending on which size you want and the silver floral hoops range from $1.99-$3.99 again depending on the size. I used 14″ hoops for my two larger wreaths and I used a 10″ hoop for my smaller wreath. You’ll also need a hot glue gun and some glue which you can get as cheap as 2$ and as expensive as 20$ at Michaels. So it’s really up to you. I just got a cheap one and have used it so many times. The first thing I did when I got home was to use wire cutters ($3.89 at Michaels) to separate each individual stem of eucalyptus from the other. I cut it as close to the base stem as I could get. Then I did the same for the flowers. (see below image for what the eucalyptus looked like after I cut it). Next, I divided in half the eucalyptus leaves and the flowers so I knew I had enough for each wreath. Finally, I took the time to lay out my flowers and greenery against the wreath in the order/positioning that looked the best to me. (Note: “that looked the best to me” is key. What looks good to each of us may be different. That’s totally fine! If it looks good to you that’s all that matters in this moment). Placing everything on the hoop allowed me to have a pretty good idea of what I wanted the wreath to look like before I went ahead and glued it all into place. It’s ok to have some “overhang” – let the greenery and flowers hang over the sides of the wreath a little bit. It will make it look fuller. When you get to the bottom, try turning the eucalyptus/flowers to face the other direction for the last few pieces (I did 2 eucalyptus and 2 flowers facing the other direction at the bottom). It fills out the wreath and makes it look complete to the eye even though it’s only a half-moon crescent. Once you know what you want your wreath to look like and you have your arrangement set up, gently pull your hoop out from under your leaves/flowers so that they roughly stay in position. That way you remember which piece came next etc.. as you glue it together. Start from the top and begin to glue each piece to the metal or wooden wreath in the order you laid it out in. To be perfectly honest, I burned the hell out of my fingertips so many times it was ridiculous. I think I got the hang of it by the end, though (or I had lost all feeling in my fingers…one of the two). The arranging and gluing process took me less than 15 minutes. After you’ve put the glue on a stem, make sure to press and hold it down to the hoop for at least 40 seconds so it firmly secures in place. Hang up your wreaths wherever you want them to go: on the door, above a fireplace etc… I hung mine using a single nail in the wall and then hung the wreath directly on the nail, finding the middle balancing point of the wreath for it to stay straight. If your wreath won’t stay straight hanging directly on a nail, you could also use a ribbon to hang the wreath. Tie it firmly around the top point of your wreath, then leave about 2 inches of slack above the wreath in your ribbon and tie another knot. This knot will hang around the nail, keeping the wreath firmly in place. I’d love to see what your wreath looks like! If you’re on instagram, tag me (@ruthdavispreston) and I’ll give you a shout out in my stories. I used to compare what I made to things I saw online or to what other “more creative” people made. Eventually, I stopped being creative altogether because I knew that my creations weren’t going to be “the best”. Since then I’ve changed my outlook on creativity, especially while making my spring wreath. I’ve decided that the important thing is that what I’m creating looks good to me and is an expression of my own hands and creative heart. An artist once told me that no matter what she created, her pieces were never truly “done” she just simply decided that she would no longer work on them. She also told me that most of her “mistakes” ended up being her best artwork and that “flaws” added character. It helped me to see that art doesn’t have a finish line or a perfect standard. I hope you like this DIY and that you love the spring wreath that you created as well! Comment below if you have any questions or need clarification. Let me know how it goes too. Don’t forget to tag me if you post to Instagram (@ruthdavispreston). Find Your Creativity and Express it! If you’re interested in more Spring Worthy ideas, check out this series on Decluttering Your House in 6 Steps. Thanks so much Katherine! I’d love to see how yours turns out too. It will look amazing on the front door for sure. I also am loving the simplicity of it. 🙂 let me know how it turns out, and thanks for pinning it! It’s so darling! I love how simple it is to make. I need one at my house! Thankyou! they are super simple and yet look great and cost practically nothing! Win win win! Love it! Honestly I would probably leave it up year-round. I think it works through the seasons. So simple and so beautiful! And what a great reminder of what it means to be Creative. Thank-you for sharing! Well I really enjoyed studying it. This tip offered by you is very practical for proper planning.